The Center for Wooden Boats’ Gala & Auction is our largest fundraiser of the year. Your generous support will: - Welcome over 4000 youth to our docks for hands-on experiences. - Preserve a fleet of heritage small craft for all to sail & appreciate. - Ensure access to the water for our entire community- for free! - Change lives one boat at a time. 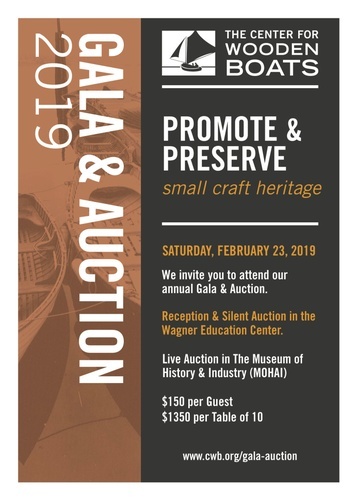 RSVP by February 15, 2019 Reservations include hors d’ouevres, hosted beer and wine, dinner, auctions and entertainment.